The Original Jack-O-Lantern: Not a Pumpkin? By reading the title of this post, you might be thinking to yourself, “Wait – is Bengtson’s Pumpkin Fest really writing about something that’s not a pumpkin?” Well, we’re writing about the Jack-O-Lantern, but with a historical take on this well-appreciated Halloween tradition. Dare we say it, but the original Jack-O-Lanterns weren’t actually carved out of pumpkins, believe or it not! We’ll get to more on that below. Explore Our Pumpkin Patch Before It’s Too Late! We hope our introduction didn’t spook you too much because there’s still time to come on down and visit our Homer Glen pumpkin patch festival here in Illinois! With our largest expansion in our 37-year history, you can’t miss out on this year’s autumnal festivities. With the crisp fall temperatures, beautiful trees and holiday spirit in the air, it’s the perfect time to find the right pumpkin to take home and make your very own Jack-O-Lantern (though again, it didn’t always use to be this way). Check out some of our attractions or read our reviews here to get a better idea of what our pumpkin picking festival is like. Now, for all of you Jack-O-Lantern lovers out there, let’s carve into the history of America’s favorite Halloween activity. What do you get when you cross a turnip with a cabbage? A Rutabaga. No, this isn’t a terrible joke with no punchline – as it turns out, Jack-O-Lanterns used to be carved out of this seemingly unknown root vegetable. Known as a ‘Swede’ in England (but not in Sweden) and a ‘Neep’ in Scotland, this Jack-O-Lantern canvas is thought to have originated in Scandinavia, Central Europe or Russia, but its precise origins are a mystery. What we do know is that the rutabaga was first described by a Swedish botanist in 1620 (perhaps the name ‘Swede’ makes more sense now), and not long after, it was documented in England and Scotland. Eventually becoming widely distributed in the 18th century, the rutabaga was eventually introduced to the Americas in the early 19th century, most likely from Scandinavian immigrants. A hollowed and carved rutabaga (or swede) is generally considered to be the original Jack-O-Lantern, though some also say that something called a mangelwurzel was used. Another beet-like root vegetable, the mangelwurzel is yellowish in color and similar in appearance to the rutabaga. It was grown primarily as animal food and is also sometimes called fodder beet. While we light candles or insert battery-powered lights into our modern Jack-O-Lanterns, early versions actually used burning coal that was inserted into the hollow chamber of the rutabaga. How the burning coal didn’t melt through the vegetable is still a mystery to us, but early Jack-O-Lanterns were carried around for a purpose that probably won’t surprise you: lanterns! Carried by “guisers” in the British Isles as early as the 16th century, these lads had a reputation for playing pranks, going house-to-house and reciting verses in exchange for food. Does that sound familiar to you? Indeed, early Jack-O-Lanterns played a significant part in forming the trick-or-treat experience as we all (dentists especially) know and love today. 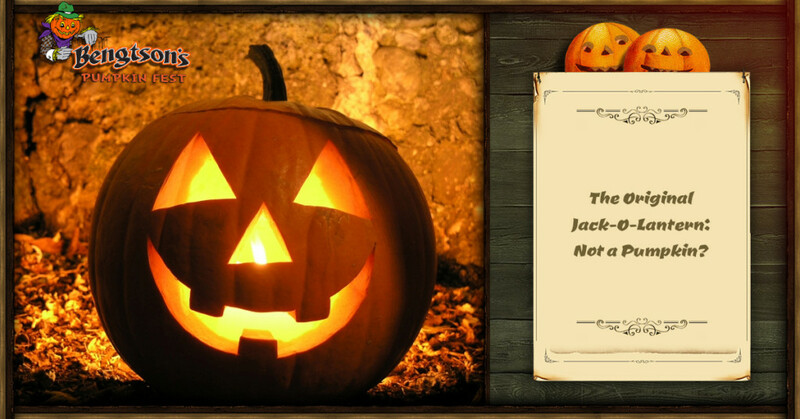 We’ve touched on Stingy Jack before, as this Irish historical figure is responsible for the name “Jack-O-Lantern.” Going back hundreds of years, Stingy Jack was a miserable town drunk who played tricks on everyone, including the Devil himself. After tricking the devil to climb up into an apple tree, Stingy Jack placed a cross at the bottom which the Devil could not touch. Jack made the devil promise not to take his soul when he died, and the Devil accepted. As the legend goes, after Stingy Jack passed away, the pearly gates of heaven would not accept him, and the Devil, keeping his promise, would not allow Jack into hell. Wandering in the darkness of the Netherworld between heaven and hell, Jack asked the devil for some light to find his way out. Jack received an ember from the flames of hell and hollowed out a turnip (rutabaga) that he had on him to place the ember inside. Forever roaming the earth without a resting place, Jack used his lantern to light the way, and thus, the Jack-O-Lantern was born. To keep the haunting spirit of Stingy Jack at bay, the Irish hollowed out turnips, gourds, potatoes, rutabagas, beets, and whatever else they could get their hands on. Placing a light inside of these hollowed-out root vegetables (the ‘hallow’ part makes sense now, doesn’t it? ), it was the hope of the Irish that these homemade lanterns would ward off evil spirits. Sure enough, in the 1800s, several waves of Irish immigrants made their way to America. They quickly discovered that pumpkins were much bigger and much easier to carve out their lanterns, and so pumpkins began to be used for Jack-O-Lanterns. As they say, the rest of Halloween is a sugar-fueled history. It’s Not Too Late To Carve Your Own Jack-O-Lantern! While you’re welcome to use turnips, beets or whatever rooted vegetable you’d like in order to make the perfect Jack-O-Lantern, we encourage you to use our fine pumpkins here at Bengtson’s Pumpkin Fest. You’ll find our massive, ripe pumpkins to be a lot easier to carve out your favorite designs and spooky faces. Besides, carving out Jack-O-Lanterns shouldn’t be an overly frustrating experience, right? For the best ‘pumpkin patch near me’ in the Homer Glen area, don’t look any further than Bengtson’s Pumpkin Fest! Any questions? Get in touch with our pumpkin festival here.